You likely know that the central nervous system is surrounded by a connective tissue sheath called mater. There are three layers: the pia mater, the arachnoid mater and the dura mater. These three layers surround both the brain and spinal cord, lining the skull and spinal canal. Many connective tissue sheaths in the body invaginate deeper into the tissue and the same is true of the brain. The pia mater is like the skin of the brain. Whereas the sheets of connective tissue that we’re considering in this post are extensions of the dura mater which also lines the skull. In the image above, you can see both a horizontal structure and a vertical structure. The horizontal structure is the tentorium cerebelli. It divides the cerebrum above from the cerebellum below. One could experience it as the ceiling of the cerebellum or the floor for the occiptal lobes. It attaches to the petrous part of the temporal bone (behind the inner ear) and travels backward to the occipital bone where it encases the transverse sinuses. 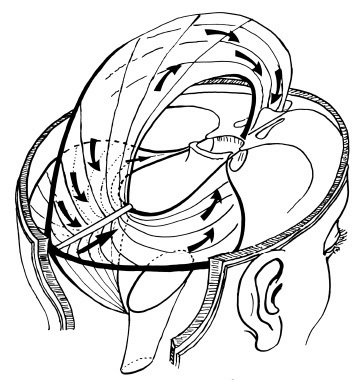 The vertical structure is the falx cerebri. It divides the right and left hemispheres of both the cerebrum above and the cerebellum below. The falx cerebri attaches to the crista gali of the ethmoid bone anteriorly. It follows the midline of the body superiorly containing the sagittal sinus. It extends as far back as the internal occipital protuberance. The two structures are continuous with one another as you can see below. Close your eyes and begin to imagine these structures in you head. Look at different pictures to help you orient these structures in relation to your ears, sinuses, eyes, palate. Begin to include the falx cerebri in the image you have of your midline structures. Practice aligning it with the center of your throat and breastbone. Begin to imagine this horizontal structure – the tentorium cerebelli – at about the level of your ears. Let it help you find right-left balance in the head. Imagine the dome-shaped top of the mouth expanding toward the top of the skull. Watch from the inside as the dome becomes larger, as if you are standing inside an expanding balloon. Imagine your whole body hanging from the top of your mouth. Let the top of your skull and the neck soften and the tongue melt. You may also think of the tongue deflating, as if filled with air that is now escaping from the edges of your tongue. Imagine the tongue becoming permeable like cotton. Let your breath float around and through your tongue. He has another image in another book highlighting the round shape of the mouth. Imagine the release of the jaw as the teeth separate and the mandible falls away from the skull. Let the tongue be wide and soft on the floor of the mouth as the palate domes and lifts. I like to suggest that students explore the cavern of the mouth allowing more space for all of its nooks and crannies. Now run the tongue along the ridge of the palate starting at the teeth. This is part of your mid-line. I like to orient it to the bridge of the nose, the breast bone, the naval, the pubic disc, the big toes and the crown of the head. As you draw your tongue along the ridge, you’ll notice that the palate is hard all the way to the back teeth and then it becomes the soft palate. Let your tongue turn over, lightly resting the bottom tip of your tongue into the soft palate. Create a soft suctioning, drawing the palate and the tongue back and up as if pulling it toward the birthing crown. After stimulating this area for a little while, rest and again cultivate the soft cavernous feeling of the mouth. Feel as if you can float the head from this soft lift in the doming palate as your body, with all of its sister diaphragms, hangs below. Explore in different orientations to gravity, going sideways, upside down, twisting and back bending. How does the palate contribute to your poses and relate to your other structures? We have moved up the body from the feet and pada bandha, the pelvic floor and mula bandha, the thoracic diaphragm and uddiyana bandha, the thoracic inlet, the shoulder diaphragm, the dome of the armpit and hasta bandha. Now we begin to move into the neck and head. 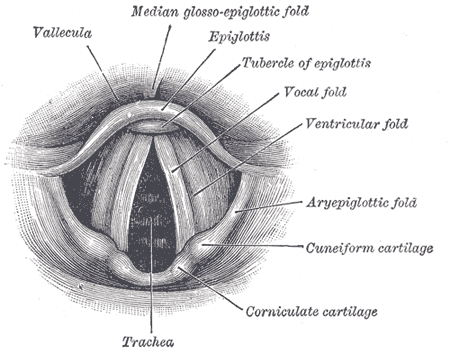 Our next structure to explore is the horizontal doming structure of the vocal diaphragm in the larynx. Gently find the thyroid cartilage in the front of your neck. It is more commonly referred to as the Adam’s apple. And then begin to make various sounds noticing what you feel in this area of your body. Perform a series of stops or consonant sounds to feel the articulation of the vocal folds. 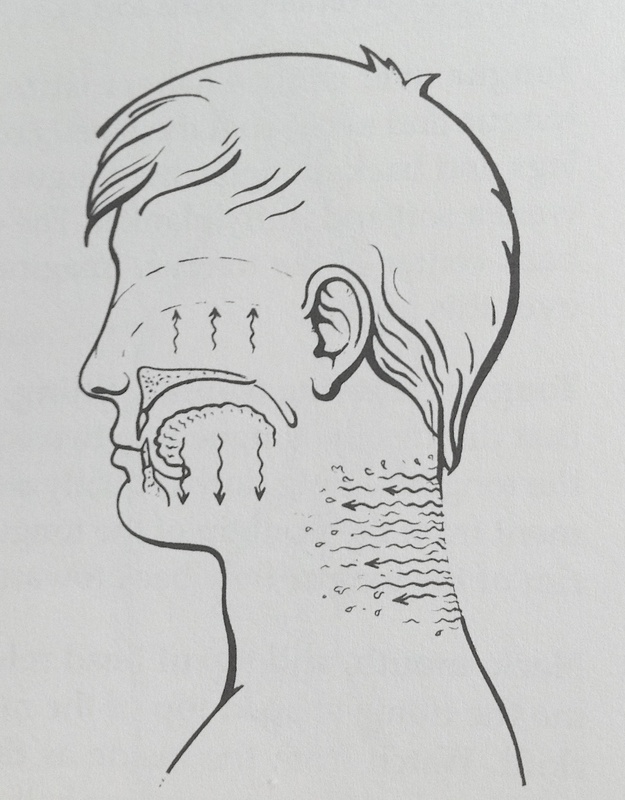 Now practice your ujjayi breath, allowing the vocal folds to softly hug the air as it passes through the trachea. Be careful not to strain. It really isn’t necessary for your neighbors to hear your yogic breath. This is a complex little area of the body and I will admit my limited understanding. For more anatomy of the vocal diaphragm and the thyroid and cricoid cartilages, view Ackland’s Video Atlas of Anatomy. 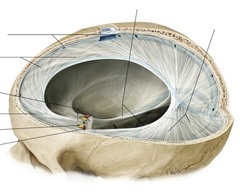 But for our purposes, there is a web of small muscles, referred to in the above diagram as the ventricular fold, that give you a right and left half of the dome. Begin to feel the full 3-dimensional space of the dome of the throat and begin to align that dome over your other doming structures as you explore neck and head alignment in your poses. A couple of poses in which it is very difficult to find head placement are triangle pose and half moon. As you tilt your body into its side plain, feel the length from tail to head and keep the vocal diaphragm in relation to the thoracic inlet as you rotate it through space to look up at the hand. This will become even more clear as we add the domes of the palate and cranium.